Our Lady of the Good Death received her pitch-black coat of paint around 1830, but since she is an ancient Madonna she must have been quite dark already before that. Perhaps she needed restoration and her blackness was confirmed by fresh paint. She was discovered in the funerary chapel of a bishop of Clermont-Ferrand in 1972. 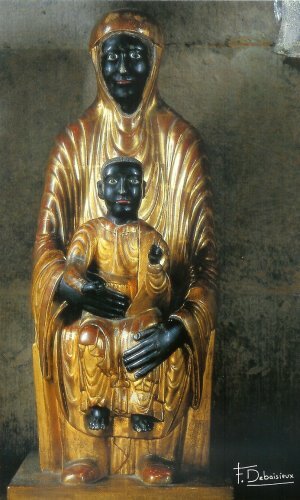 Many Black Madonnas were found in cemeteries, funerary chapels and crypts. Crypts are church basements originally built to house the tombs of martyrs. Later they became a privileged burial place reserved for bishops, kings, and queens. Several Black Madonnas in their crypts are known as "Notre Dame de Sous Terre," which I like to translate as "Our Lady of the Underworld" (literally: Our Lady from under the earth). So Mary in general and the Black Madonna in particular, became a guide through the underworld, through death to resurrection. As the Gate of Heaven she birthed God into our world and births us into His. Yet we are human and naturally afraid of loosing our life. Brigitte Romankiewicz suggests that in the Black Madonna our shadow self is embraced and transformed. (*2) Hence we don't need to pretend we are not afraid of death. We are accepted, loved, and nourished with our fears until we can let go of them. Another form of a good death is the death of the 'old man,' the 'false self,' the self that perceives itself as a separate, independent entity from God. According to Jesus and Paul this old self must die in order to resurrect as the 'new self,' which experiences itself as one with the Divine. (*3)Some medieval Christians sought this death of the old self by undergoing initiation rites that sent them to meet the Black Mother of the Underworld in a dark crypt filled with tombs. *4: E.g. the Afro-Cuban sisterhood "Order of Our Lady of the Good Death", though highly syncretistic, it is approved by the Catholic Church. Probably founded around 1820, it puts on a big parade and festivities commemorating the death and assumption of Mother Mary. Devotion to Our Lady of the Good Death used to be widespread in Brazil.